(The preview blogs have been somewhat delayed as access to the internet has been somewhat minimal since I left the TGV in Munich en route to Sarajevo, and the 58th edition of MESS – the theatre festival of small and experimental work from across Europe and the rest of the world). From Munich I’m taking the night train (Lisinki sleeper) through the Austrian Alps , taking me through Germany, Austria, Slovenia and Croatia. Slovenia is the base of Via Negativa who are presenting THE NINTH at MESS on the Saturday night. Set to the entire score of Beethoven’s majesterial Symphony no 9, The Ninth explores the differences, similarities and boundaries between man and animal . 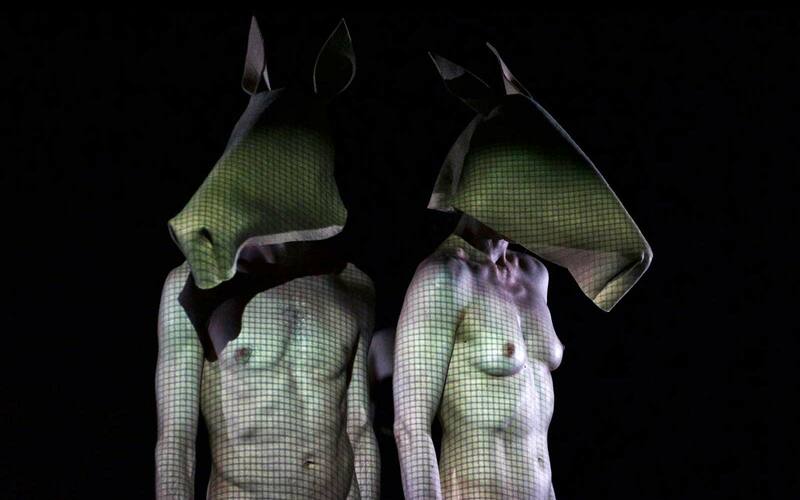 The performers ‘naked and suspicious’….’not sublime but explicit’…’nothing great about us. Nothing triumphant. Blind by the images they see, deaf by the sounds they hear….looking for a connection with The Animal’. It looks and sounds extraordinary and I cant wait to see it! Via Negativa opens MESS festival on Saturday night at the Sarajevo War Theatre, following the performance of Open for Everything at National Theatre Sarajevo. VN is a platform for research, development and production of contemporary performing arts. We are focused in devising and exploring different performing strategies, with an emphasis on ethics and liveness of performance practices, procedures and genres. In addition to the production we regularly conduct workshops, which every year take place in Ljubljana the form of the VN Lab – the Via Negativa laboratory for contemporary performing arts. VN was founded in 2002 and operates under the artistic direction of theatre director Bojan Jablanovec. Our creative field is reduced to basic stage elements (via negativa) and focused on the relationship between performer and spectator (between what is shown and what is seen) and on the question of the real in this relationship. We deal with this relationship as a complex flow of points of view, expectations, judgments, conclusions, stereotypes, fallacies, prejudices, tolerance or intolerance, and knowledge or lack thereof; all of these trigger various emotional, rational or irrational responses. We insist on the performing with the standpoint that consciously radicalizes and relativises its own position with self-irony and humor. Our performing strategies are very diverse: devised theater pieces, lecture-performances, dance pieces, video works, radical body practices, gallery projects … We develop our work through the performance cycles: Seven Deadly Sins (2002–2008), Via Nova (2009–2011), Irresolvable (2012-). Meanwhile back to the Lisinki – I am planning to sleep through Slovenia – see you in Zagreb!